Bradley Stoke Rotary Club’ are supporting local Bristol charity ‘The Bristol Children’s Charity’ an amazing charity which supports local children in a variety of ways. Over the Christmas period Bradley Stoke Rotary Club, raised money by offering the opportunity to win a beautiful luxury Christmas Hamper, through this exercise we were able to donate £303 to the charity. Our thanks go to the many local people and businesses who supported us in this event. 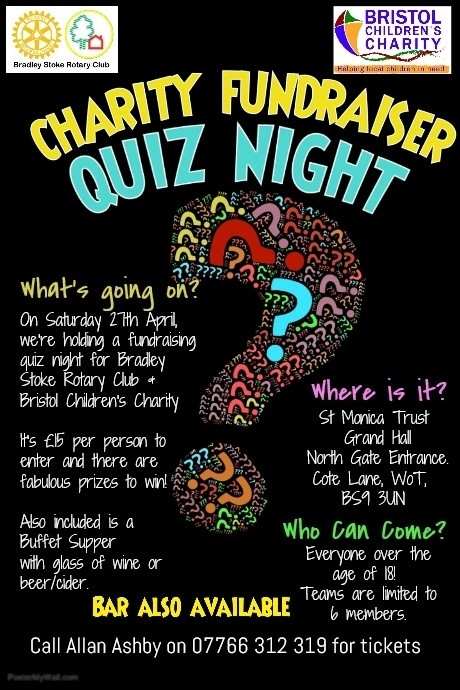 Our next event is a Quiz Night being held in the Grand Hall at St Monica Trust, Cote Lane on Saturday 27th April 2019. . We know many of you enjoy putting your general knowledge of the most random details, to the test. So do please come along with your friends to this event which promises to be a fun night. Max of 6 to a team and the ticket price includes a lovely supper and one free drink. Please see the poster for contact details and more info.